The story of SmokeShack BBQ is a simple one. It began with a couple who loved to entertain their neighbors and friends with great barbecue. They took their love to prepare great Que to the next level. They began competing in barbecue competitions all over the southern United States. They did this while still maintaining full time jobs. Along the way, they had the opportunity to eat at the finest BBQ joints in America and taste the food of the best bbq cooks on the circuit. Bottom line, they know what good Que tastes like. After much thought on whether to continue competing on a weekly basis or try to spend more time in the area, they decided to open up a "mom and pop" barbecue joint here in Ormond Beach. Now that wouldn't seem like a great idea given the fact that there were several national barbecue chains in town, another barbecue place not two miles away but that didn't matter because they knew the barbecue was going to be world class, different than you have ever tasted before; that once you tasted it you would be back. And that is how it has been since August 2009. SmokeShack BBQ is all BBQ. All our meats cooked over wood smoke. 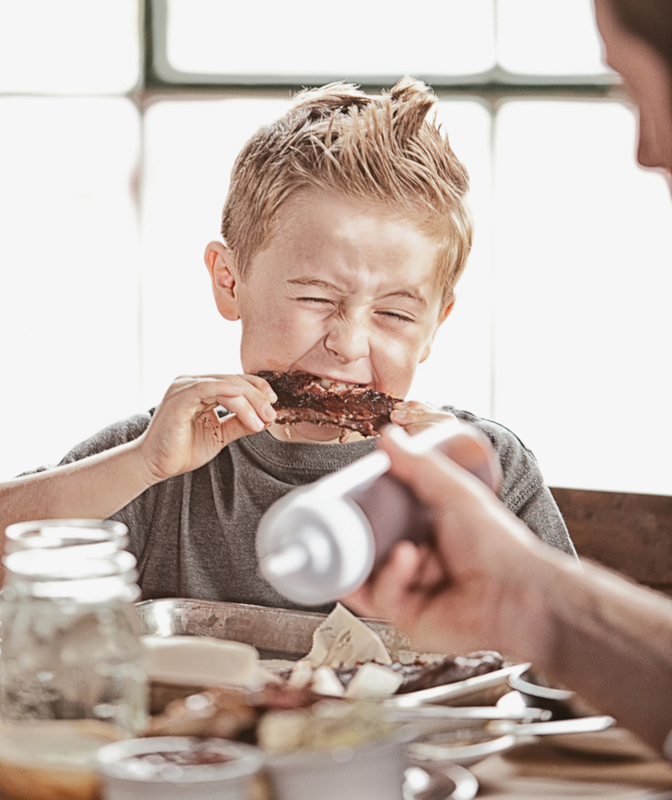 (No gas used in the process) The pitmaster at SmokeShack's only concern is to baby-sit that Que until it gets to you. The pork and brisket are infused with flavor both inside and out prior to being placed in the pit. More flavor is added during the cooking process. They add a little more just prior to hitting your plate. The marinades and rubs they use are the same ones they used winning all those awards. You can't get them at your local grocery store. They have them made just for them. The ribs are St. Louis cut. That means they are the center portion of the rib cage, below the loin or baby back and above the breast bone. You just take a spare rib and cut the breast bone off and you have a real meaty St. Louis cut rib. Ribs are not cooked frozen and we don't par boil them. They are given a generous dose of their special rib rub, put in the smoker for several hours, they are then wrapped and more flavor is added. They are just short of falling off the bone. The chicken and turkey get a good coating of rub and then put in the cooker until it reaches 185 internal temperature. They cook the chicken a little hotter and quicker so that when you get it it is good and moist. Sometimes you might see a little “pink” but that’s because it’s cooked in a smoker. Also we don’t sauce the meat prior to serving it to you. There are five unique sauces at your table to select from. All have won awards at BBQ competitions all over the South. So remember, this is an old fashioned barbecue joint and it always will be. Let’s get one thing straight right now. You came here to eat barbecue and it is our goal to give you the very best you have ever tasted and make sure you are full when you leave. So take a look at the menu and choose what you want. If you have any questions, one of our friendly staff will answer it for you. Oh, and thanks for givin’ us a try.